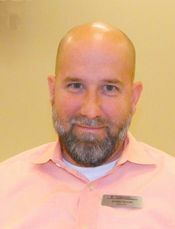 NORTH HOUSTON– A new chamber of commerce has been formed by Chris Sears, a business coach and former real estate agent for 17 years. According to Mr. Sears, the new chamber is Northeast Area Chamber of Commerce, formed by him and accredited by the U.S. Chamber of Commerce association 2 months ago. Sears told the Northeast News that there are currently 55 members in the chamber, and its focus is on small businesses, providing them with resources for their activities. Membership in the chamber comes with a free phone app for your computer or smart phone, and a free website. A mobile version of this website costs $30 per month, he said. Other benefits of the chamber membership include business coaching. Membership in this chamber starts at $360 per year, and depending on number of employees in your company, has levels at Silver $900, Gold $2400, and Platinum $5000. Sears claims that you will receive benefits equal to your membership in a two month period. More information is available at 222.thechamber online.com or 832-308-3403. 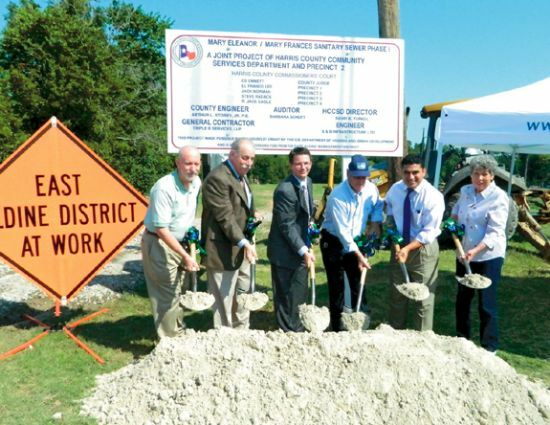 Officials from several cooperating agencies gathered last Friday morning, under a hot sun, to break ground on a project for new sewer trunk lines in the subdivisions known as Mary Eleanor/Mary Francis. The ceremony took place at the intersections of Bertrand and Shady Lane. The project will serve about 200 homes on Bertrand and Mierianne Streets. AUSTIN – (June 21, 2012) – The Texas Water Development Board (TWDB) today approved by resolution a grant in the amount of $9,909,094 and a loan in the amount of $577,000 to the East Aldine Management District (Harris County) from the Economically Distressed Areas Program to finance water and wastewater services. The District intends to use the funds for the construction phase of a project to provide first-time municipal water and wastewater services to the 1,585 residents of the Sherwood and Benton Place Communities, in what is known as Zone 11. The East Aldine District is currently constructing trunk sewer lines, a lift station, and water trunk lines in this area east of US59. The grant will allow additional work to bring these lines to individual homes. The TWDB is the state agency charged with collecting and disseminating water-related data, assisting with regional planning and preparing the State Water Plan for the development of the state’s water resources. The TWDB administers cost-effective financial programs for the construction of water supply, wastewater treatment, flood control, and agricultural water conservation projects. Aldine Education Foundation’s steering committee announced the addition of new members to the permanent board at its last meeting on June 7th, and detailed committee assignments and restated long term goals. They also were able to announce several large grants that will be received in the future. Organization work is being led by the consulting firm of Foundation Innovation. At the meeting, AISD superintendent Wanda Bamberg noted the goals of the foundation, to “enhance the school district, with teacher improvement and scholarships.” Laurie Cromwell of Foundation Innovation further defined that as providing programs that tax dollars do not pay for, funding innovative programs, supporting underfunded programs, and providing scholarships and teacher or academic excellence recognition. The Foundation would like to raise its funds without galas or other “death by event” type functions. Instead, it would seek support from a database of donors and grant sources. Originally the plan was to raise money by the end of the year, 2012 when the foundation is organized and functioning. Laurie Cromwell of Foundation Innovation said that a typical goal for a district this size would be 100 to 250 thousand dollars the first year. At the June 7th meeting however, it was announced that major grants of $350,000 each had been designated by the Brown Foundation and the Arnold Foundation. Exec. Comm. Director at Large: Kyle Sadler. It was noted that Seth Sharr is also president of the Aldine Scholarship Foundation, and there was some discussion about how the two organizations would work together and not overlap functions. ASF has the goal of providing scholarships for Aldine ISD students that will attend Lone Star College, and AEF will provide funds for other scholarships and activities. Five new members were added to the board at this meeting: Lisa McBride, John Cornett, Jocklynn Keville, Gilbert Hoffman, and Richard Cantu. The board also consists of Rose Avalos, Dr. Wanda Bamberg, Rey Chapa, Jeff Hartmann, Seth Sharr, Susan Deison, and Merlin Griggs, Sr.
Also added to the board at the last meeting on May 1st were Patti Acosta, Crissey Bauman, Craig Brast, Sidney Brewer, Shane Cotiaux, Darrell Garcia, Brian Ellis, Nadine Kujawa, Jerry Loyd, Dr. Baxter Montgomery, Tim Rosenborough, Kyle Sadler, and Terry Williams. The Foundation has filed for IRS state as a 501c3 nonprofit entity, and expects that ruling to be finalized soon. Between now and the end of the year, organization and fund raising will continue. The board meets once per month. 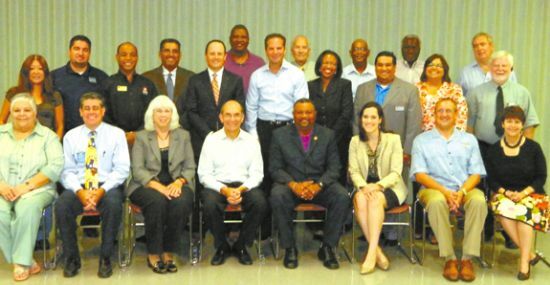 The Airline Improvement District Board of Directors is working in conjunction with the Houston-Galveston Area Council (H-GAC) and Harris County Community Services Department on a “Livable Centers” study aimed at facilitating the creation of a vision plan to provide multi-modal transportation options, improve quality of life for residents of the District, and promote economic development. The third and final public workshop for the study is on Monday, June 18, 2012 from 5:00pm – 6:45pm in the cafeteria at Carroll Academy, 423 Gulf Bank Rd. Houston, TX 77037. At this meeting, the Project Team will present the Proposed Projects for the District and make recommendations as to how the District may implement those projects. All project concepts were developed using input gathered from the community at the first and second public meetings and from surveys completed by study participants. The format of the workshop will include a presentation by the Project Team detailing the public outreach, research, and evaluation methods used to determine which Proposed Projects are best suited for the district. Meeting attendees are encouraged to participate in a Q&A after the presentation. Refreshments will be provided for attendees, and activities will be provided for children! Spanish-speaking members of the project team will be present, and nametags will clearly identify them. State Rep. Armando Walle is hosting a series of workshops to provide help to the community with issues affecting the public. The first community workshop about Healthcare was last Thursday, June 7 and offered assistance on CHIP and Medicaid among other information related to healthcare. “Gateway to CARE” was one of the agencies that participated; it is a community health worker training institute that bridges healthcare gaps through education. According to Gateway to CARE, there are 1.2 million people without a health insurance just in the Harris County, and 6 million in Texas. GoodNeighbor Healthcare Center and the Aldine Clinic of Harris County Hospital District were also present to provide information about the topic. More information of health care reform can be found at Texas Health Options texashealthoptions.com or by calling 1-855-839-2427. Also visit www.healthcare.gov for the latest information. “Domestic Violence” will be held on June 14; it will provide resources on how to deal with domestic violence. June 21 “Higher Education” workshop will discuss higher education opportunities and issues. This workshop also will offer the chance for a lucky HD-140 high school student to win a scholarship toward higher education. 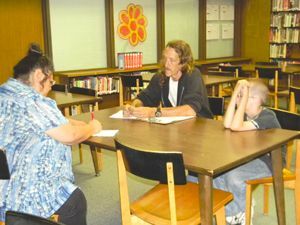 June 28 “Workforce Development” will provide resources for people seeking unemployment assistance and help finding work. All workshops are schedule from 5:30 p.m. to 7:00 p.m. at Aldine Sr. High School, School Library, 11101 Airline Drive, Houston, Texas 77037. For more information on these events, contact Myriam Saldivar by phone at (713) 694-8620. 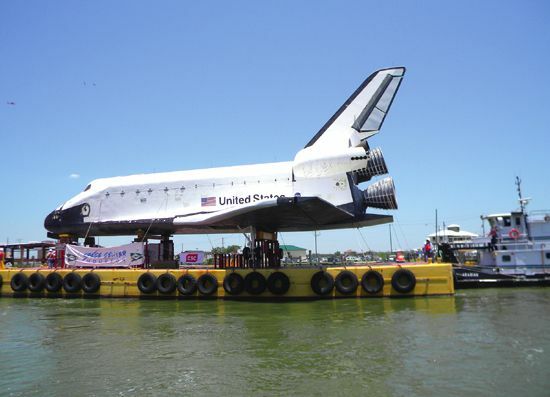 Clear Lake was the scene last Friday noon, of a dramatic “sail-by” as the government moved a replica of the Space Shuttle to its new permanent home at Space Center Houston. Tug boats pulled and pushed the barge holding the Shuttle up the channel, under the Highway 146 bridge, past the Kemah Boardwalk, and on to a temporary mooring next to the Hilton Hotel on the north shore of Clear Lake. 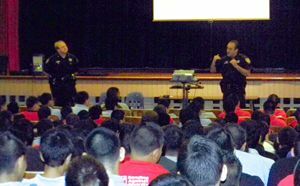 ALDINE–Last week on Tuesday, May 29, Bonding Against Adversity hosted a “Teen Summit” at Hambrick Middle School. The main purpose of this event was to provide students with helpful information regarding common students’ problems such as how to protect against cyber bullying. Deputy Garland White with the Harris County Sheriff’s Office and with the participation of some students exposed different examples of bullying. Students were paying attention and identified themselves with the bullying problem. The Teen Summit lasted all day long and other issues were addressed: dealing with self esteem, early pregnancy and how it changes your life and HIV prevention. 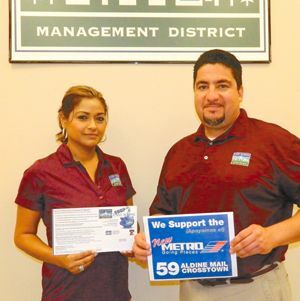 Participating were State Rep. Armando Walle, and Sheriff Garcia.